6-year-old Spencer Reisner aspires to be an astronaut and to go to Mars, he also wants to discover new sources of fuels and expand his knowledge on nanotechnology. He was recently able to achieve one of his objectives in an L.A mall. 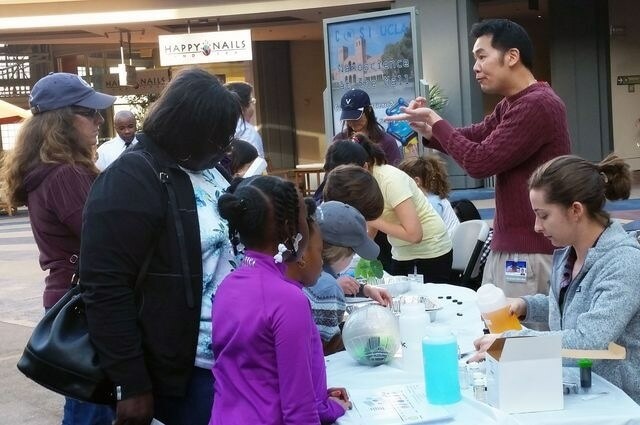 Jia Chen, education director at the California NanoSystems Institute at UCLA, explains to a crowd of bystanders at the Promenade mall that atoms, while very small, can form large objects in a variety of shapes. Graduate student Pascal Krotee pours out a solution to demonstrate how water can be purified by using a filter made from nanomaterials. The Promenade in the Howard Hughes Center did not look like a shopping center on February 20th. Instead a booth was set up by the staff of UCLA’s California NanoSystems Institute (CNSI), who along with graduate students and volunteer scientists, demystified nanoscience in a fun-filled atmosphere. Nanoscience is a subject area that isn't easily understood by the general public, and the term itself sounds a little scary. The term still does not have a place in the Merriam-Webster Dictionary. Spencer was an eager participant in the easy-to-understand nanoscience demonstrations conducted by Jia Chen, education director, CNSI. My favorite things were how fiber optics work and how things repel water. I want to go to UCLA! “This is 10 times greater than we thought it would be,” remarks Spencer’s mother, Frankie Drayus Reisner, of the demo show. She was particularly impressed by UCLA scientists who answered many simple questions, without making people feel stupid or foolish. The booth was crowded for the three hours it was open, with children and adults who gathered around to assemble molecular and atomic models, conduct experiments with hydro-phobic surfaces, and find out how nanoscience impacts their daily lives in many unknown ways. The American Physical Society funded the UCLA project, Nanoscience in the Mall. The project was a scheme devised by Chen with his colleague Sarah Tolbert, professor and faculty director of CNSI outreach. They discovered that on average Americans spend about four hours at a shopping mall per week. They realized that this time period would be enough to show them what the study of atomic or molecular scale materials is all about, in a fun way. Nanoscience looks less esoteric and less remote, after the experience of meeting a real nanoscientist at the shopping mall. People aren’t expecting to encounter UCLA nanoscientists at the mall. According to Chen, the basic aim of the program is to offer the public a new venue to interact with working scientists, and realize the relevance of nanoscience in their personal lives. He noted people’s response to this. They are immediately fascinated by the fun atmosphere and become comfortable enough to dive right in with questions and comments. They quickly learn what ‘nano’ means (one-billionth part of something) and how it impacts their lives. And they can have a conversation over coffee with the scientists who make these discoveries. We hope this leads to a greater curiosity and greater understanding of nanoscience, its benefits to society and why supporting its advancement is important. Reaching the attention of the adults, whose opinions matter in public policy, is a difficult proposition, though CNSI conducts educational programs catering to teachers and students of middle and high schools. So Stephen Schieneman, a shopper, was asked about e-tablet, in order to evaluate a mall’s effectiveness as a learning platform.